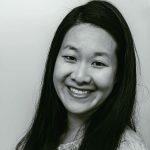 Published Jul 10, 2017 By Julia 3 CommentsThis post may contain affiliate links. 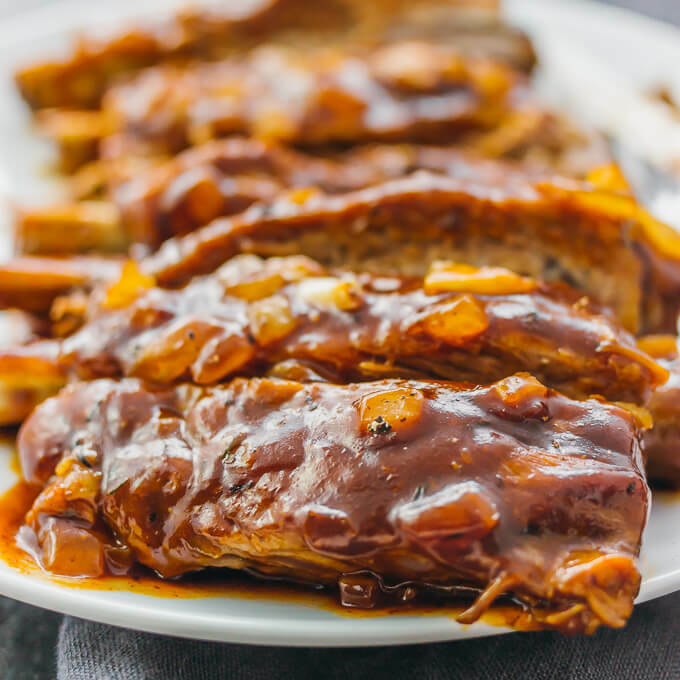 Pork ribs with barbecue sauce and onions are one of the most delicious and simple dishes you can make with an Instant Pot or slow cooker. This pressure cooking method is also much faster than slow cooking, as it takes 45 minutes from start to finish compared to 3 1/2 hours of slow cooking. Below I’ve documented each step so that you can easily visualize the preparation and cooking of these ribs, and I’ve also included a short description about making this in a slow cooker if you don’t have an Instant Pot. The first thing you want to do is to remove the membrane from the ribs. This is how I do it: slide a knife under the membrane to loosen it from the ribs. Then use a paper towel to grasp the membrane and slowly pull it in one direction to remove. The second step is preparing a dry spice rub. 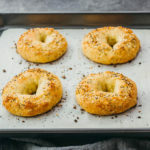 This is totally optional and you can skip this step, use a store-bought spice mix, or make a homemade version like I did. If you make your own, mix the spices together and rub them along both sides of the ribs. After removing the membrane and adding the spices, you’re ready to start pressure cooking. Add the minimum amount of liquid needed to run your pressure cooker — for the Instant Pot, this is 1 cup of water. Then place a steam rack over the water. If you’re using an Instant Pot, it likely came with a trivet that you can use as a steam rack. Bend the ribs so that they will fit into the pot and place them on top of the rack. Use the manual setting to pressure cook on high for 20 to 25 minutes. I typically cook for 20 minutes, but you can cook up to 25 minutes if you’re looking for meat that’s meltingly tender and falling off the bone. After that, to release pressure I use natural release not quick release. Natural release takes about 20 minutes, and that adds to the 20-25 minute cooking time. If you use quick release, your cooking time will differ. After the ribs are cooked, I transfer them to a plate and cut them up a bit for easier handling. I also remove the steam rack and discard all of the liquid. Then I add the ribs back into the pot with chopped onions and a generous amount of barbecue sauce. Using the saute setting on the Instant Pot, I cook until the onions are tender and the barbecue sauce has thickened a bit. The ribs are then ready to serve, topped with spoonfuls of onions and sauce. 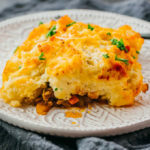 Slow cooker version: Don’t have an Instant Pot? No worries — you can easily make this in the slow cooker, but it will take longer. 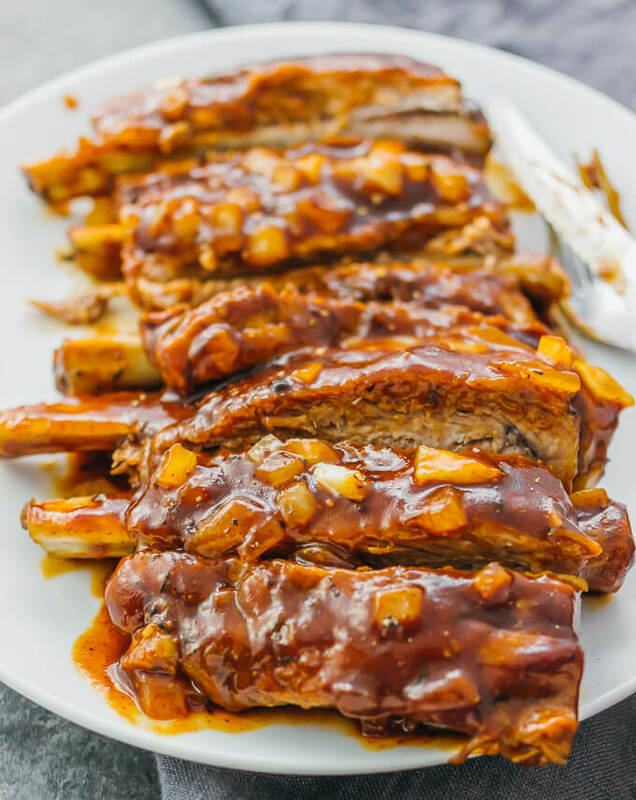 Prepare the pork ribs in the same manner as above (remove the membrane and rub the ribs with dry spices), then add the ribs, chopped onions, and barbecue sauce to the slow cooker. Give it a good stir and then cook on high for 3 1/2 hours. 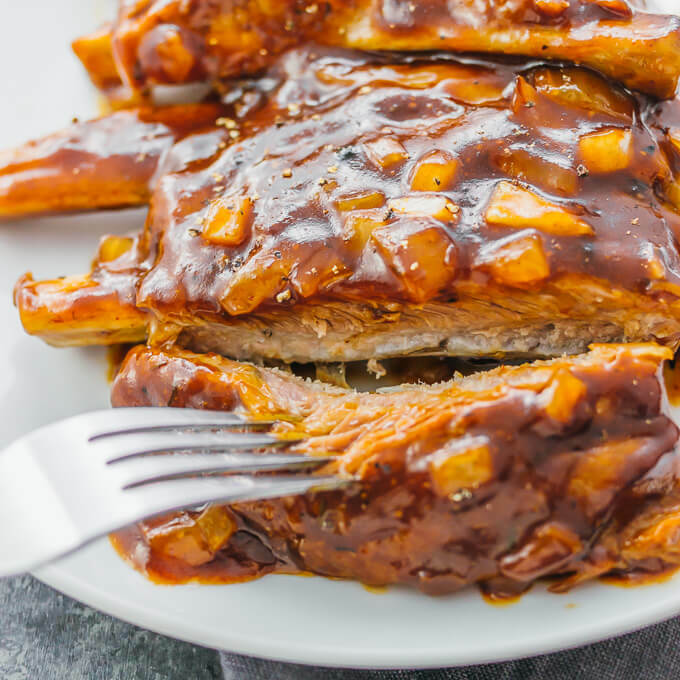 You can call it a day and enjoy the ribs at that point, or you can transfer the ribs to a baking tray and bake for about 10 minutes until the sauce caramelizes a bit. If you’re feeling ambitious, you can make your own homemade barbecue sauce using the Neelys bbq sauce recipe or this simpler version with just 7 ingredients. If you’re low carb, you can follow this keto bbq sauce recipe. 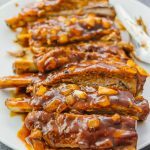 Pork ribs with barbecue sauce and onions, a simple dish that can be made in an Instant Pot or slow cooker. Combine all dry seasonings in a small bowl and stir to mix well. Rub the spices onto the ribs. Add minimum amount of water to the pressure cooker (1 cup for the Instant Pot). Place the steam rack inside. Add ribs on top of the steam rack. Cook at high pressure for 20 minutes (up to 25 minutes for fall-off-the-bone meat), followed by natural release, about 20 minutes. Transfer the ribs to a plate, cutting them into pieces for easier handling. Remove the steam rack and discard all liquid inside the pot. Set the Instant Pot on the sauté setting. Add chopped onions, and place the ribs back into the pot. Drizzle barbecue sauce on top, stirring with the ribs and onions. Cook for about 5 minutes or until the sauce has thickened a bit, stirring occasionally. Serve ribs and spoon barbecue sauce and onions on top. 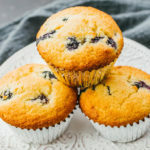 The Instant Pot makes this so easy!